At the elite level, a large difference in performance between the three medalists on the podium is not typical. We see this across various individual strength sports such as weightlifting, sprinting, and gymnastics. One percent could be the difference between missing and breaking a world record. In weightlifting, both lifts are very explosive with neither one taking more than a few seconds to complete, and optimum power output must be produced. There is often only 2.5 kg separating the lifters in the top 5 spots, meaning the smallest variation in performance can be the difference between securing a medal and failing to place. Sports, which have very little variability between the top athletes who place, express a need for training modalities that can push performance just by a slight increase. Because numbers can easily measure weight training progress, athletes have a tendency to pursue testing methods often. The aggressive consciousness, which weightlifters seem to possess, is a rivalry against oneself, and often leads to overtraining. Athletes typically have a competitive personality, which makes them assume overworking is better than underworking. The theoretical goal is to design a training program that will provide stress, but not continue to the point of distress. Little room for error can be left when peaking and every competitive advantage should be used for a successful performance. These factors can be measured and maintained by monitoring mood and excessive arousal while helping avoid the negative effects of over-reaching, which can lead to over-training. A stressor is anything that may knock the body out of balance (a.k.a. homeostasis). *for more on homeostasis and stress read here. The stress response is what your body does to re-establish the balance. 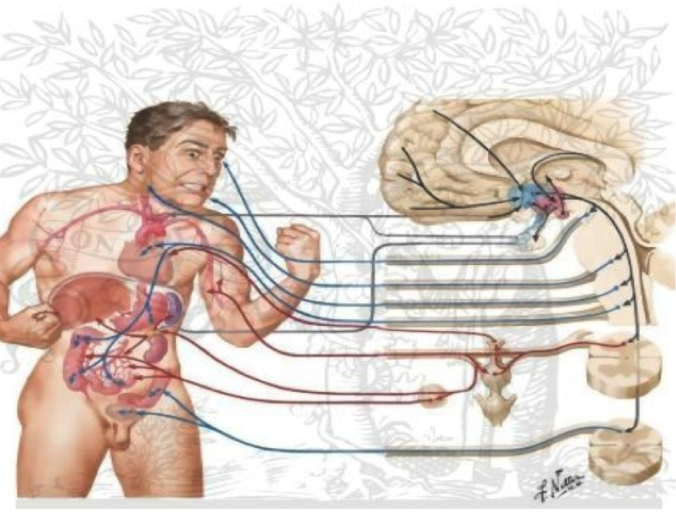 Your body’s physiological response mechanisms are beautifully adapted for overcoming short-term physical traumas. When we turn on the same physiological responses that are provoked chronically with heightened arousal, it then becomes disastrous. Fitness and fatigue cannot exist independently and often the demands of competitive athletes do not match according to the current level of not only physiological functioning, but psychological. Almost all athletes are overworked in some capacity, and although we all want to embrace ‘the grind’, constant excitement will cripple our success for long-term athletic development. Many of us fail to differentiate between activating a stress-response out of necessity and for the sake of it. We become accustomed to turning our anticipatory defenses into an uproar of unnecessary activation. If you constantly mobilize energy at the cost of energy storage, you will never create a reserve for when it counts the most (aka competition). Excessive arousal may seem necessary, but more often than not is hindering performance as opposed to aiding in a successful attempt. While 1-3 are indeed important, they do nothing to help you run away from the lion and must be “ignored” for the time being. Yerkes & Dodsen (1908) developed the inverted-U theory in an attempt to explain the affiliation between arousal and performance. The relationship is curvilinear, specifically stating performance is lowest when arousal is very high or very low, and optimal at a moderate level (Singer et al., 2001). In Weightlifting, an athlete must presumably lift the most weight possible during an optimum level of arousal, however, either hyperarousal or diminished arousal may lessen performance (Jensen, 2009). Although heightened arousal can impair the performance of some motor tasks, the relation between a stressor and the change in arousal varies markedly across individuals. It is also important to note that there are always exceptions to the case, but the vast majority of people happen to perform better with moderate levels of arousal. What is considered a eu-stress for one individual may in fact be a dis-stress for another. New athletes often make an assumption that psyching up or creating a high level of arousal is imperative to optimally complete a heavy lift. While higher arousal helps strength, compromised coordination and technique may occur, especially if technique is still being learned. The common mistake a lifter will face is overdoing it or using techniques at the wrong moments in training. A beginner is less groomed and so the motions of their sport are not as habitual in those who have ample amounts of experience. Typically a beginner will do better with low levels of arousal because performance is based on utilization of relevant cues and narrowing of attention as arousal increases. Too many cues, or an excess of arousal, can cause the lifter to heighten his or her state of sensory sensitivity to a state of hyper vigilance. When we approach a lift with excessive arousal we can trigger inappropriate responses such as excessive physical strain associated with somatic anxiety. Once a lifter becomes accustomed to the motor patterns of their sport, then they will be able to determine their optimal zone of functioning within the arousal continuum. New athletes get a pass because they don’t know any better. For those of you who are familiar with training and are constantly in the weight room screaming about your next lift to come, you are wasting your time and giving us all headaches. You’ve also caused a substantial amount damage, which now must be dealt with somehow. You simply can’t train like this as often as you’d like. Threat Matrix Theory (Visser & Davies, 2010) explains how any number of multiple outputs may form from a stress response. We do not only encounter a single variable altered during this process. Determining which part of the fatigue was caused by the training itself, and what was caused by the emotional stress of an elevated arousal state is the hard part. A stressor may be as simple as anticipation before a competitive situation, which at first may appear as psychological, but as it manifests becomes physiological as well (Jensen, 2009). Such a response can lead to a failed lift or technical failure resulting in injury, or improper recovery causing you to peak or fatigue earlier than you should be when competition time comes (Lee, 1990). Competitive weightlifters understand competitions provide incentive for hard training. A successful meet involves more than being stronger compared to competitors of the same weight class. In addition to physical training, psychological aspects such as mood and vigor will play an important role in an athlete’s performance as well. Don’t train harder, train smarter. Profile of Mood States Questionnaire (POMS) is a standard validated psychological test formulated by McNair et al. (1971) which requires you to indicate for each word or statement how you have been feeling in the past week. Athletes scoring below norms on scales of tension, depression, confusion, anger, and fatigue, and above norms on vigor, are said to possess a ‘positive profile’ that graphically depicts an iceberg. Monitoring of mood states may offer potential methods of mitigating loads, whether that be psychological or physical. Serious athletes will push their bodies hard enough, often riding that fine line between wellness and illness. Simply tracking how you feel related to qualitative variables, which mirror excess stress, can be of use to athletes and coaches. You can do this by writing it in your training log (if you don’t have one yet, what are you waiting for?). Remember, stress comes in all shapes and sizes and we deal with it enough, so why add more to training than necessary? Optimizing performance is contingent upon proper stress regulation and will differ between training and competition environment. Coaches are often attempting to increase the likelihood of success within an athlete’s performance and will make most of the decisions for an athlete, but for those who do not have this advantage should educate themselves. In accordance with proper programming, mental skills training to control or alter arousal levels may be of interest. Beginning to use skills during practice will have a carry-over effect in competition, and is valuable in both situations. Utilizing such skills will not likely benefit the day of competition if not practiced. Learn how to create a balance with combinations of relaxation and intensity. These are two things that don’t seem to go together when you first think about it. Managing arousal levels is key in not only competitive situations, but during training as well. If you experience every lift in a working set during training as a max effort lift you will pay the price. Being able to harness nuclear energy is the name of the game. Conserve it for a time when it is most necessary. To understand the stress response, fundamental knowledge not only of physiology but of psychology as well, must be possessed. Dani Tocci is an eccentric individual whose primary goal is to cultivate a positive growth mindset with everyone she works with on both a sport consulting level and with training. Having a not so typical background with degrees in art and philosophy gives her an edge on her thought process. Dani is a competitive olympic weightlifter and has had the pleasure of working with national level athletes. Follow her on Instagram (@d_tocc) for all the happenings.